An Interview with Cayce Zavaglia. Read on and find out more about Cayce and her work. Please tell us briefly a bit about yourself. I am a mother of 4 and live in St. Louis, Mo. I have a Bachelor’s of Art in Painting from Wheaton College and a Master’s in Painting from Washington University. I have been working on this series of portraits now for about 10 years. I believe your four children are all under the age of 10, your dedication to your art despite the many responsibilities as a mother are commendable and an example to us all Cayce! 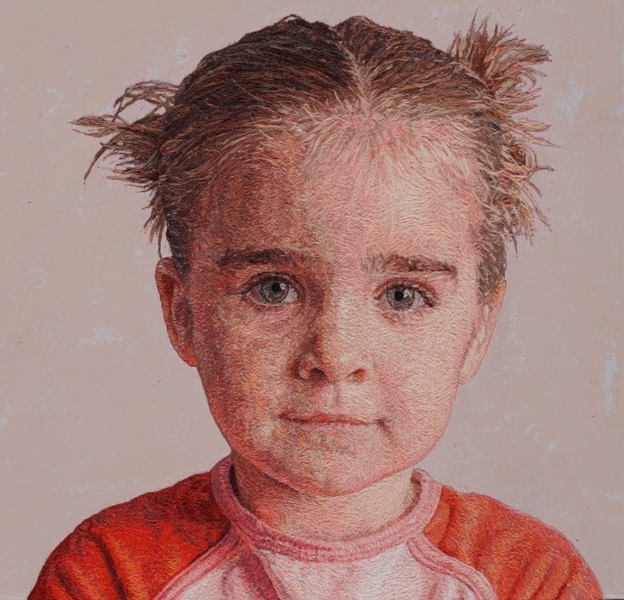 I see from your website that you are a painter but have diversified your medium to include painting portraits in thread. What made you decide to try this medium? I started this series when I was pregnant with my daughter and wanted to establish a non-toxic studio. I gave myself a summer to experiment with various materials and came up with nothing. 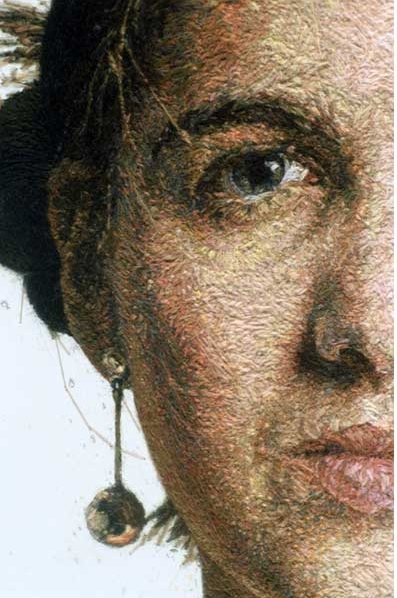 I kept thinking back to a crewel embroidery piece I had done as a child growing up in Australia…and wondered if I could sew a portrait. I picked Crewel wool simply because of this one piece…so I could reference back to it and find how to use crewel in a modern way. I like the fact that crewel embroidery seems kind of old fashioned. You mention that you initially found the range of crewel wool very limiting but have created a way of mixing the thread on fabric to produce the illusion of a third shade. It is certainly challenging but necessary to do this as we do not have the freedom to mix our paints – do you stitch the threads side by side or do you place them randomly over an area to get this effect? After trying traditional stitches for an initial practice, I realized that it was the material alone that I was interested in using. I needed to apply my knowledge of drawing and painting to the embroidery. The technique has evolved over 10 years…but is pretty much a renegade haphazard approach to embroidery. I do all the things you aren’t supposed to do…like making knots and dragging the wool way from here to there. 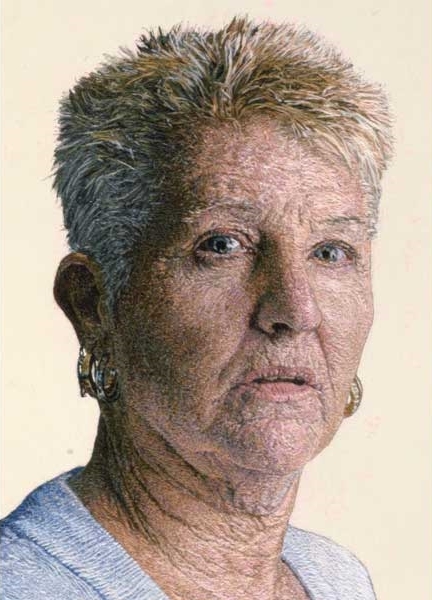 Your technique is interesting – it does not look like long and short stitch but more like a pointillist technique of using short stabbing stitches, similar to the renowned artist Georges Seurat? It is a combination of long and short stitches, lots of dots, and a little bit of chaos…but the wool always travels in the direction that your hands might travel over a face if you were touching it. This adds to the 3 dimensional quality of the work. Out of all the periods of art history, I hate pointillism the most. Ironically, that is exactly what I am creating…pointillist renegade embroidery. Your “little bit of chaos” certainly produces stunning results! 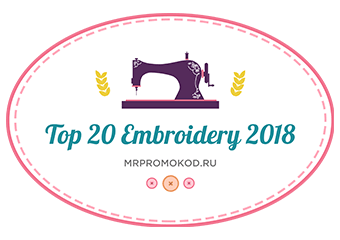 I think we will all be relieved to hear that you don’t stitch perfectly smooth stitches and that it is not a pre-requisite of producing such fine art! I can’t resist asking how long would you say each of your stitches is? This is a great topic of debate in the needlework world! I would say that the longest would be an inch…but the majority are tiny stitches and dots. Do your stitches follow a sequence, i.e. row by row or are they randomly placed? Do you work some stitches on top of others or one layer? They don’t really follow any sequence…other than they are flowing in the direction the skin would flow. Some areas are much thicker than others. Usually I rough in an area with a general color and big stitches, then get more specific to fill it in. Then add additional details or color with the dots or small stitches. This same process is done to also achieve a specific color that I see but don’t possess. If I need a shadow flesh color that is coral, brown, and lavender…then I might throw it in with a brown stripes, then add the coral color in between the stripes, then dot the whole thing with lavender…and try to get those colors to blend visually when you step back from the work. This is really painting with the needle! Do you use one strand of crewel wool in the needle or more and do you have several needles threaded at a time to enable you to change colour or do you end off each one before starting the next? I typically use just one strand..however, I have used 2 threads when I am trying to achieve the nub of a fabric in a shirt. Examples of that are in “Greg” in his fleece zip up coat, in “Sophie” on her crocheted top, and in the current piece I am working on which shows the inside of a hoodie. I just stop and re-thread after each color. I sew with not a traditional crewel embroidery needle…but rather with a quilter’s basting needle. It has a bigger eye but it a long strong needle and so I am not having to grasp something so tiny to sew. So glad to hear you re-thread after each color. I can’t function with all those different needles and threads placed on my stitching, interesting that you use a quilting needle. The detail in your work is incredible and your use of colour is sublime. I think my favorite is Sophie, how do you create the life like hair, eyes and skin tone do you attribute this to your technique or masterful placing of your colours? With each piece, they have slowly become more obsessive. I try not to get overwhelmed with the thought “how can I make this look like Sophie… or how can I make it look lifelike…or how can I capture the reflection in her earring.” Instead I break it up into smaller steps. I ask myself “can you make that one brown hair?” Once that is done I move onto what is next to it. “Can I make that little coral speck that is touching the hair…..and so on. I am mentally only thinking about 1 cm of the image at a time and block out everything else. Sometimes I work upside down, because I can’t reach up to the top of the hair. This process abstracts everything and turns it all into darks and lights, lines, and shapes…and makes it easier to forget about what I am doing. I have been doing this for 10 years now and have learned which colors will achieve a desired result. I hardly ever take out stitches. If I see that the color is wrong with the first stitch then I will remove it…but other than that I just build over the wrong colors and hope that it will add to the diversity of color in the face. Trying to take out a section is virtually impossible seeing the stitches are so numerous and small. A woman after my own heart, no unpicking just add in stitches! Good advice to see it as pieces rather than an overwhelming whole. Approximately how many colours would you say you use in one portrait? My first piece Elly I used about 30 colors…and now I have the majority of Appleton Wools…I think a few hundred. I probably use at least 200 of the colors in a portrait. Hopefully our readers will have a new appreciation of how many colors are needed to obtain a realistic effect in an embroidered piece! Your subjects seem lit up from inside is this attributable to your use of light and shadow? I light my portraits heavily on one side during the photo session to help achieve the 3 dimensional look…and to give me a wider range of colors to choose from for the whole face. I don’t want the whole portrait to read as peachy flesh tones…I want to find the burgundy’s and purples and greens in the shadows. I am currently working on a portrait of my 26 year old nephew. He has a full beard and wild hair. Today I was sewing coral and lavendar shades in his left shadowed cheek…which I thought was a great juxtaposition against his wild grizzly man look. I don’t think I have ever seen work with so much SOUL in it – you obviously have an intimate relationship with your subjects and this is obvious in the beautiful way they are portrayed. I feel as though I can tell their personality just from looking at your portraits, like I have been introduced to them personally. Your Aunty Lin certainly looks like a real character! Do you work from photographs of your subjects and do you trace a pencil outline onto the fabric first? I work from photos and start with a photo shoot of 150 or so photos. I narrow these down to about 5…then select a final image. 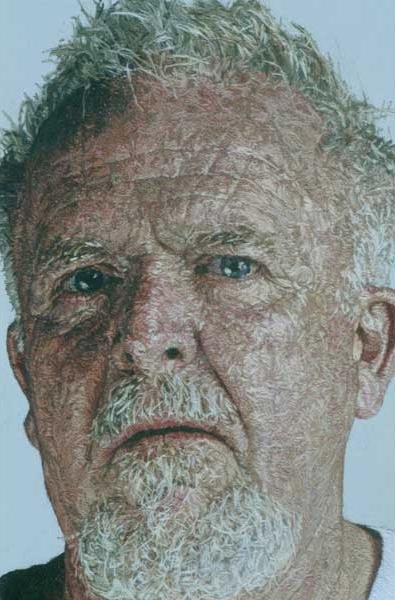 I have the image transferred onto the fabric…but then do a line drawing on top of the transfer of each shadow and shape I see in each square inch of the portrait. This is done with an ultra fine black marker or pen. Even though the photo is on the fabric, it is simply a guide for the drawing. I tape an enlargement of the photo directly beside it and am looking at this for all the information regarding color, texture, etc. You mention that you use a linen fabric. What exactly do you use i.e. a medium/heavy weight close weave Irish or Belgian linen or something else? The fabric that I use is actually a cotton linen fabric with a not too tight of a weave. It is actually an upholstery fabric. Do you stretch your fabric onto an artists stretcher frame as you would do if paintings in say oil paint? I begin each piece with it stretched with staples onto a panel. I then paint, build up, and distress the backgrounds…before beginning the stitching. Once the painting is done I then stretch the work onto a working stretcher to stitch. This is secured with clamps onto an embroidery type easel that my Dad built for me. Once the whole embroidery is complete, I then re-stretch it onto a painters stretcher frame. They are about an inch thick (not a traditional stretchers frame) and are sturdier to handle the final stretching. 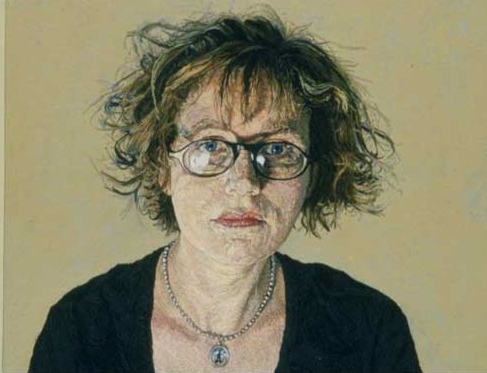 Lastly but not least the big question – how long does it take you to do one portrait? Each portrait takes me approximately 6 months. Cayce thank you for taking the time to do this interview with us. I appreciate the way you have openly shared your ideas with us and know that I am personally very motivated by your unlimited approach to this work and the process by which you create each piece. 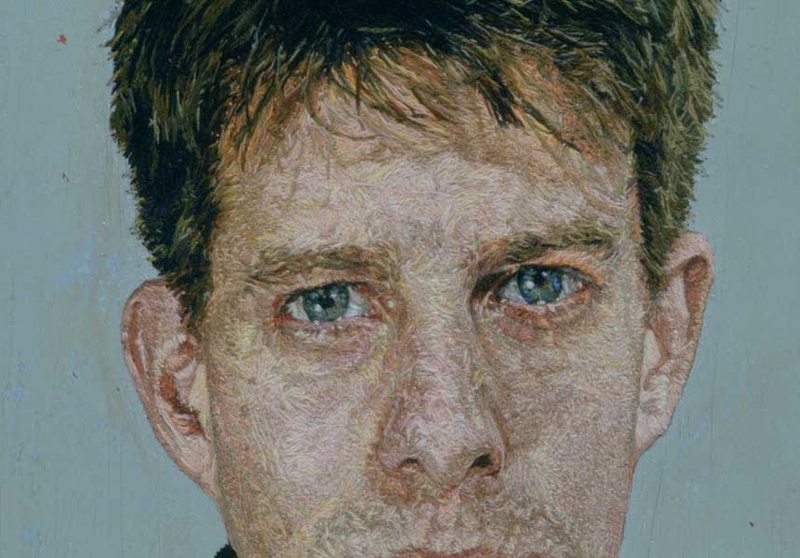 It is gratifying to see that embroidery can achieve such greatness in the art world. I think we can all identify with the challenging medium you use to paint your portraits and that each one of us will be inspired to reach for the stars! It’s really incredible, what a wonderful work ! Incredible!! She is a true artist. One thing that really captured my attention was the eyes in each portrait; they are so expressive and capture the soul of the individual. Thanks, Trish for sharing this. yes aren’t the eyes amazing they draw you in! Thank you so much for sharing this with us and helping me to widen my horizons. Exactly my sentiments – it was very motivating for me to challenge myself further. Wow! No words to express my feelings.Thank you Trish for sharing this interview with us. Pleasure Anita hope it inspires.